Since the early era of recorded sound, music has played an integral part in moving movie audiences along with the story. That symbiotic relationship may best be felt any time a patron settles down in a darkened theatre to watch a sinister story – scored with equally forbidding music. Local concert-goers were treated last night to two bands that specialize in edgy scores and re-scores, as Morricone Youth joined Goblin’s “Sound of Fear” tour for three hours of eeriness at Baltimore Soundstage. Even by Charm City standards, the entire evening was decidedly creepy. 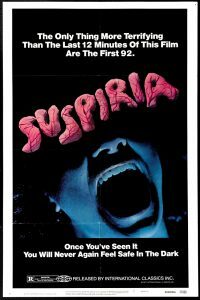 Goblin composed most of the score for the1977 film Suspiria. Legendary Italian masters of the horror movie soundtrack, Goblin are best known for their seminal album “Roller”, as well as collaborations with directors such as George A. Romero and Dario Argento. Goblin have scored a number of genre cult classics, including Suspiria, Patrick, The Church, Deep Red, Tenebrae and Dawn of the Dead. Their synth-heavy progressive rock regularly veers into a nightmarish territory, making them a truly original and iconic entity. Opening for Goblin, New York’s Morricone Youth set the stage for the atmospheric happening. Formed in 1999, Morricone Youth has scored such cinematic classics as Alfred Hitchcock’s The Lodger, Mad Max, Night of the Living Dead, and – most recently – Sunrise: A Song of Two Humans. Morricone Youth’s eleven-song, forty-five minute set included selections from its re-score of Mad Max; “Maestro in Baghdad” (from The Adventures of Prince Achmed); “Diabolique By Starlight” and “Another Honeymoon” (two cuts from Sunrise) and “Barbara”, “Traumatized” and “Beat Em or Burn Em” – three pieces from Night of the Living Dead. 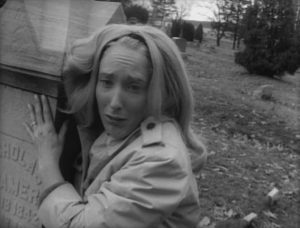 Judith O’Dea clutching a gravestone in Night of the Living Dead. From a musical standpoint, both Goblin and Morricone Youth were rock solid. This may not be the kind of music you want to hear for three straight hours (not because it’s bad, but because it is so intense), but they were well-received by an appreciative Baltimore audience. “Suspiria Suite” and “Night of the Living Dead” were the clear highlights for most concert-goers. The lighting and sound were spot-on – a rarity in an era when so many music venues crank things up to the point of utter distraction. Our only criticism of the show is in the placement of the projector screen, which – for those down front – was largely obscured by the bands on stage. We don’t want to be too harsh here, as the venue really isn’t designed to maximize the sort of show at which the two groups excel. And from a distance, the partially-hidden films made for a surreal backdrop. Still, it would be interesting to follow this tour to a site where the entire package could be presented as intended. As any fan of George A. Romero will tell you, there is more happening on the screen than initially meets the eye. Speaking of film, this Monday and Wednesday, the Charles Theatre in Baltimore will be screening Dario Argento’s 1977 classic Suspiria. As noted elsewhere, Goblin composed most of the film’s score in collaboration with Argento – creating the music before the film was actually shot. For those who missed Saturday night’s concert, the two Charles screenings should offer a heart-pounding taste of Goblin’s iconic sound. Please enjoy the following photos from Saturday night’s concert at Baltimore Soundstage. Credit all photos Anthony C. Hayes.